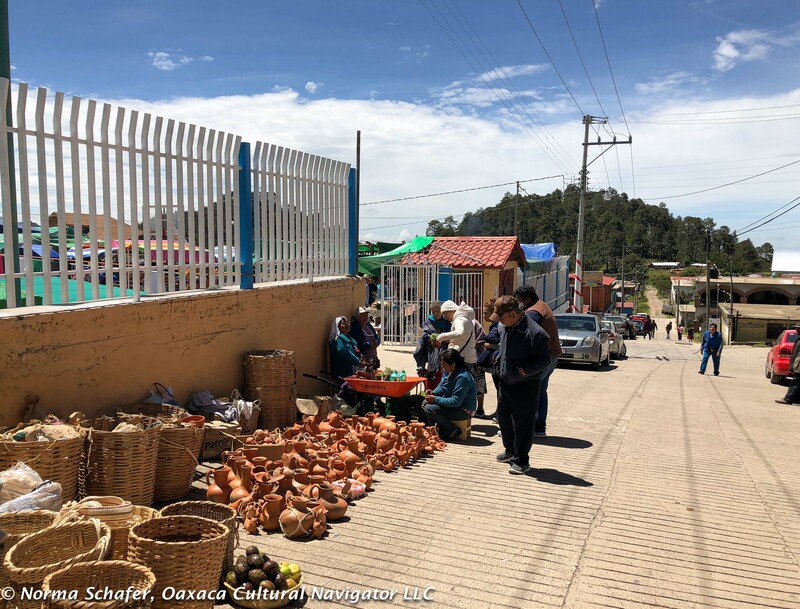 Just a forty minute drive into the mountains from the Tlacolula de Matamoros crossroads at MEX 190–Panamerican Highway — is the village of San Antonio Cuajimoloyas. It is one of several known as the Pueblos Mancomunados for eco-tourism. A Zip-Line crosses the village and mountain bikes are everywhere. A basket of wild mushrooms. Yummy. 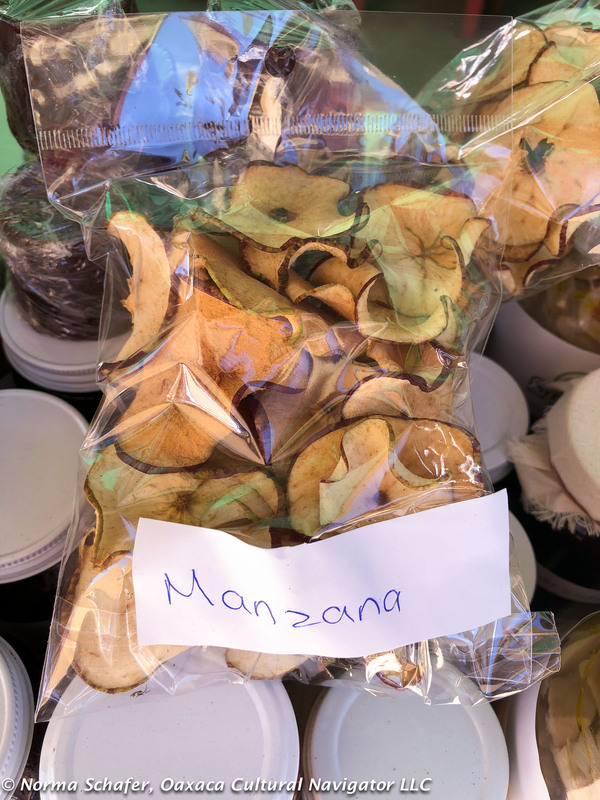 Each year during Guelaguetza time they host a two-day, Saturday and Sunday wild mushroom fair. It is much more than that: it is a natural food lovers paradise. 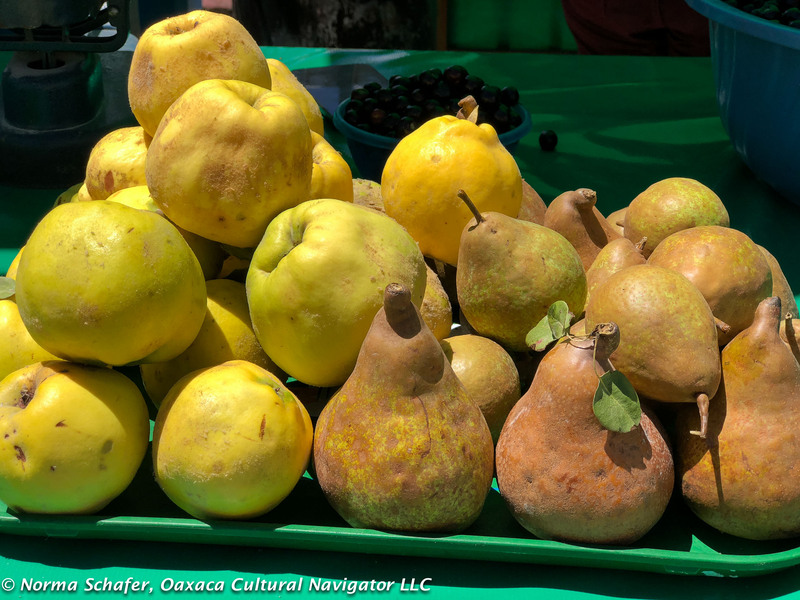 I went on Sunday when Oaxaca city was filled with 150,000 tourists and all the attendant frenzy and the Tlacolula market nearly impossible to navigate. 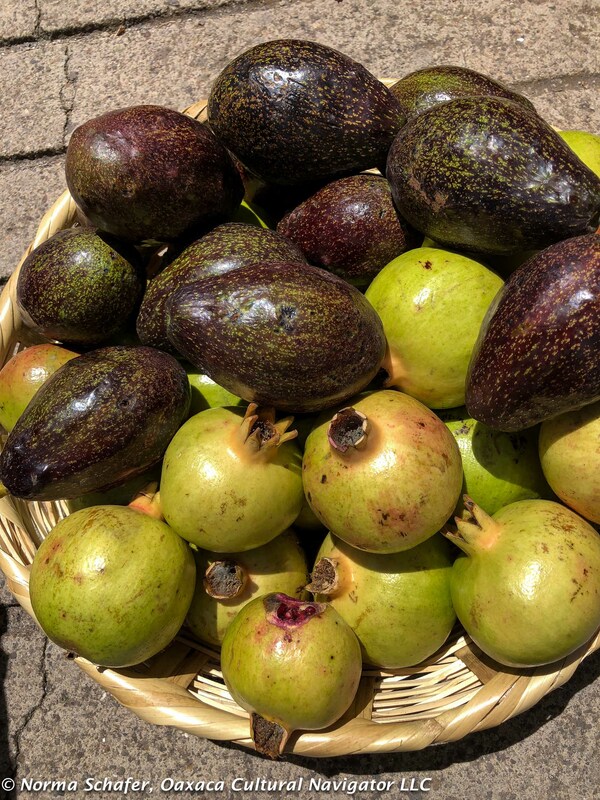 Avocados and pomegrantes. Five pesos each. Not only are the temperatures at least ten degrees cooler at 10,400 feet altitude. 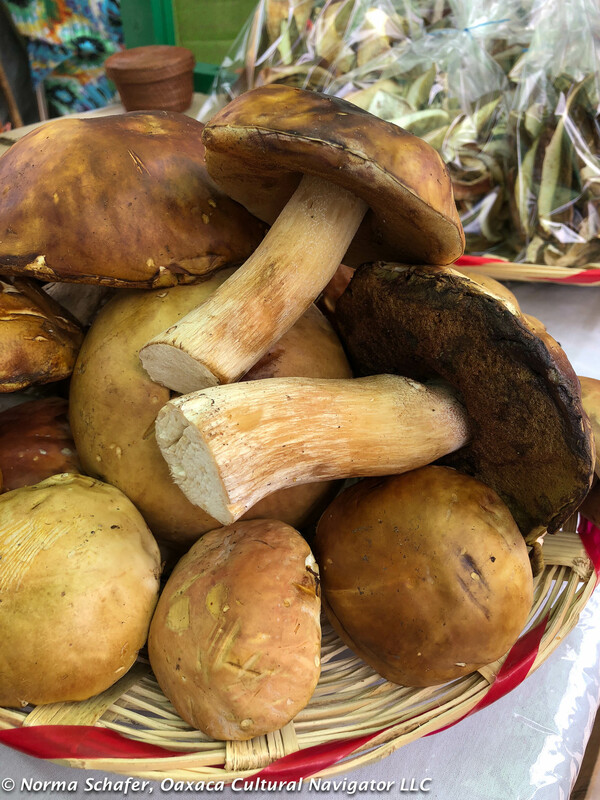 What is very cool is the showcase of all the organic foods produced in the region as well as mushrooms. 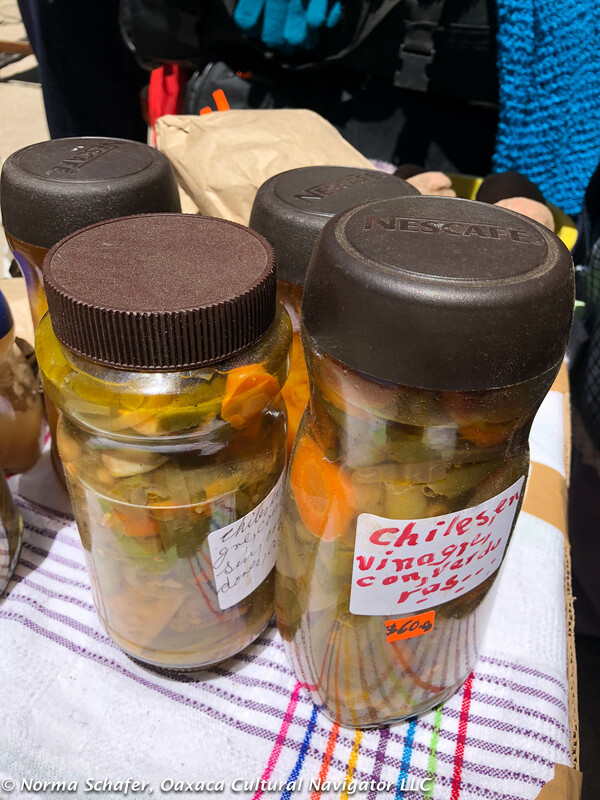 Gathered around the municipal building courtyard, small local growers are selling apples, potatoes, peaches, avocados, fava beans, onions, artisanal chocolate, mushroom cultivation starters and preserves. The fruit is always small, pocked and insecticide-free. Not giant perfection as we know in the USA. At this moment, you might ask: What’s the difference between the Spanish words Hongos, Setas, and Champiñones. Hongos are referred to as FUNGI. 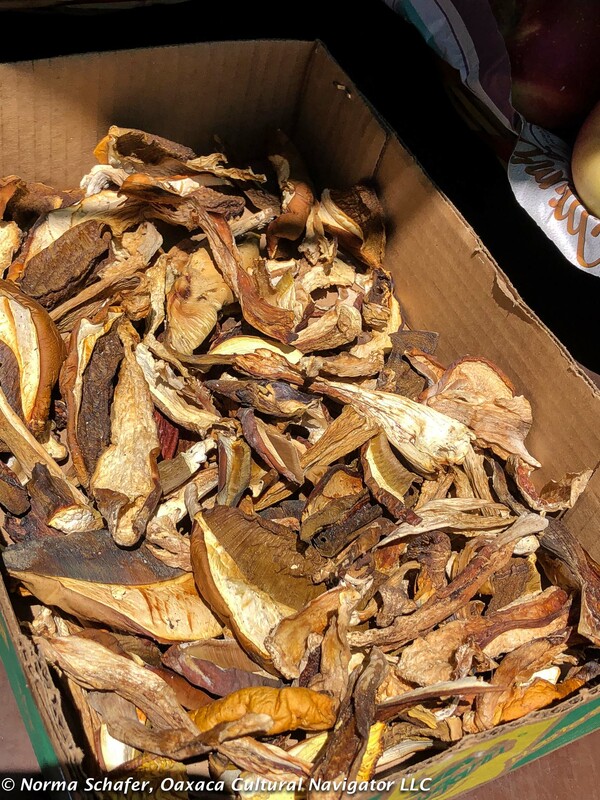 Setas are called MUSHROOMS. Champiñones are cultivated, commercial mushrooms. Around these parts, the Hongos are always the wild variety. But of course, the locals can tell the difference and name each variety. For example, the yellow ones with the red tops are called amanitas. Delicious sauteed in olive oil and butter. 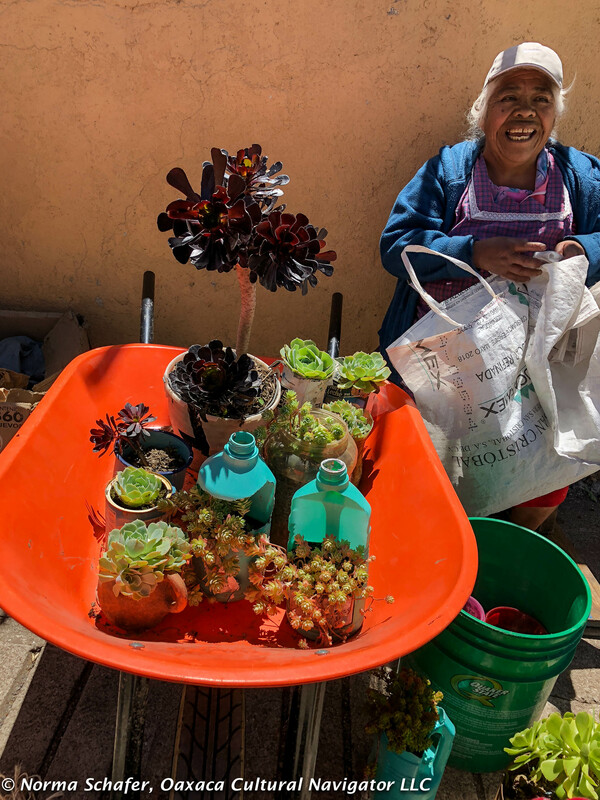 They grow flowers here as well as succulents, so there are wheelbarrows filled with plants potted in recycled plastic bottles and yogurt containers. 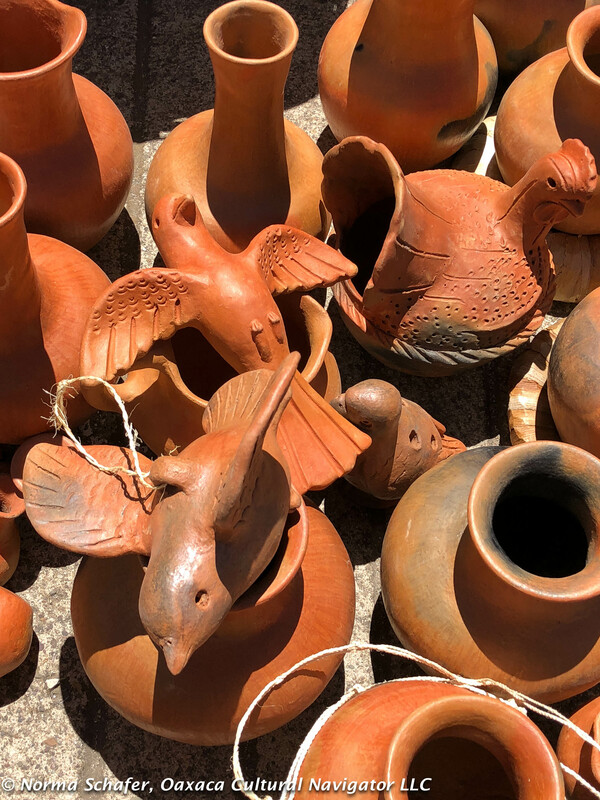 There are artisans from surrounding villages who also make an appearance: potters, weavers and embroiderers. 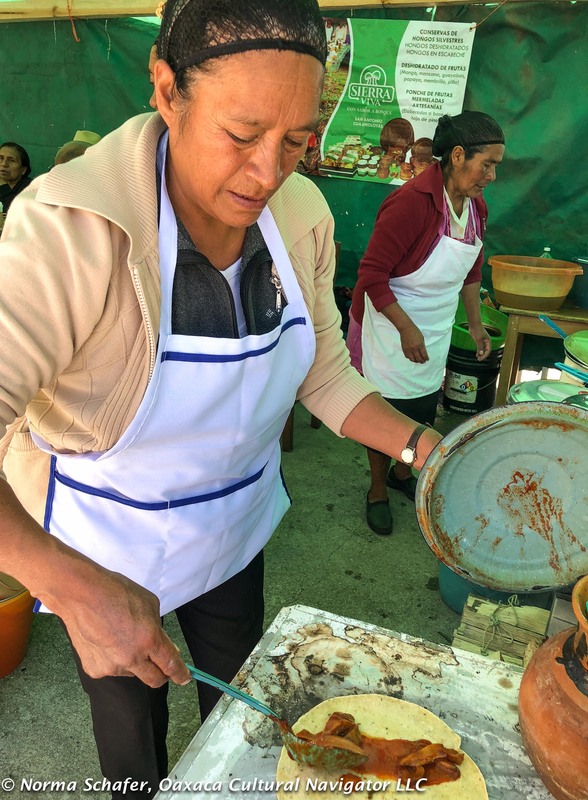 Along the periphery of the municipal building, small puestos are set up that are equipped with wood-fired stoves and comals. 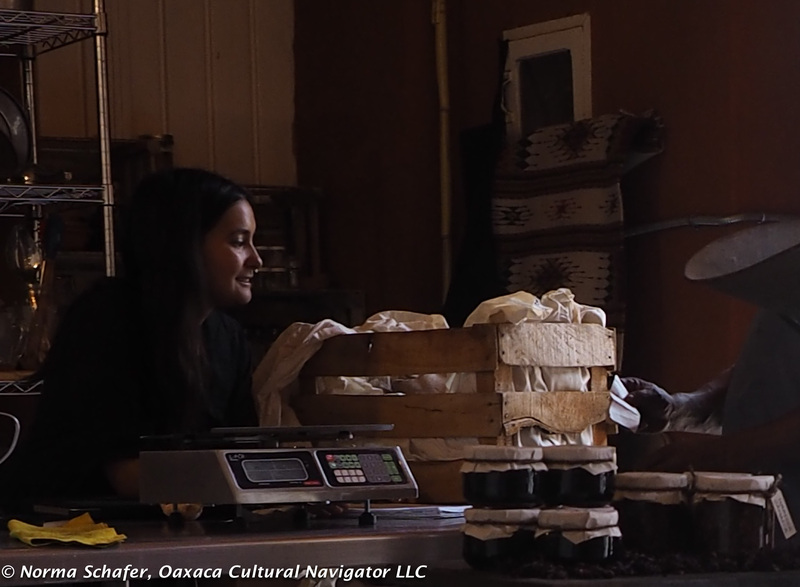 Local cooks prepare everything with the wild mushrooms — tacos, empanadas, mole, pozole. It’s like a progressive dinner where you go from one kitchen to another to taste the specialty of the house. There were perhaps a handful of hueros (those with pale skin). 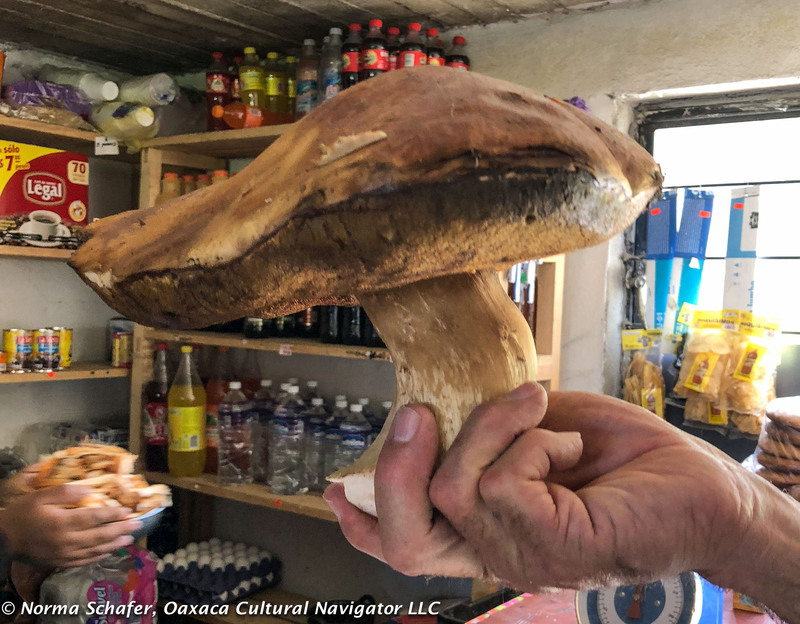 Most visitors were locals from Oaxaca who know that this is where you come to get the most delicious fungi around. It’s the rainy season, but there has been no rain. 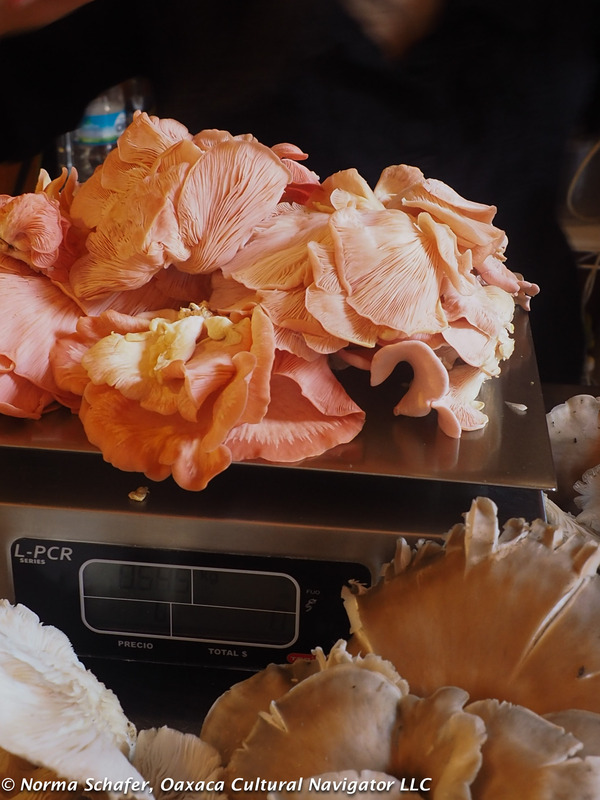 The vendors from Cuajimoloyas brought the wild mushrooms in from Llano Grande, farther up the mountain where cloud cover ensures the proper humidity. 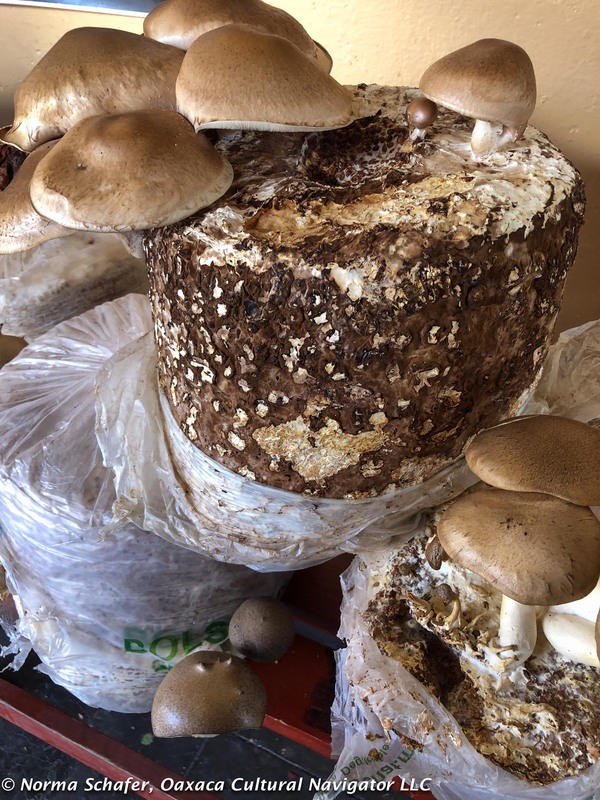 On our way out of town, I spotted a pile of beautiful mushrooms perched in the doorway of a comedor. I said to Laurita, let’s stop! 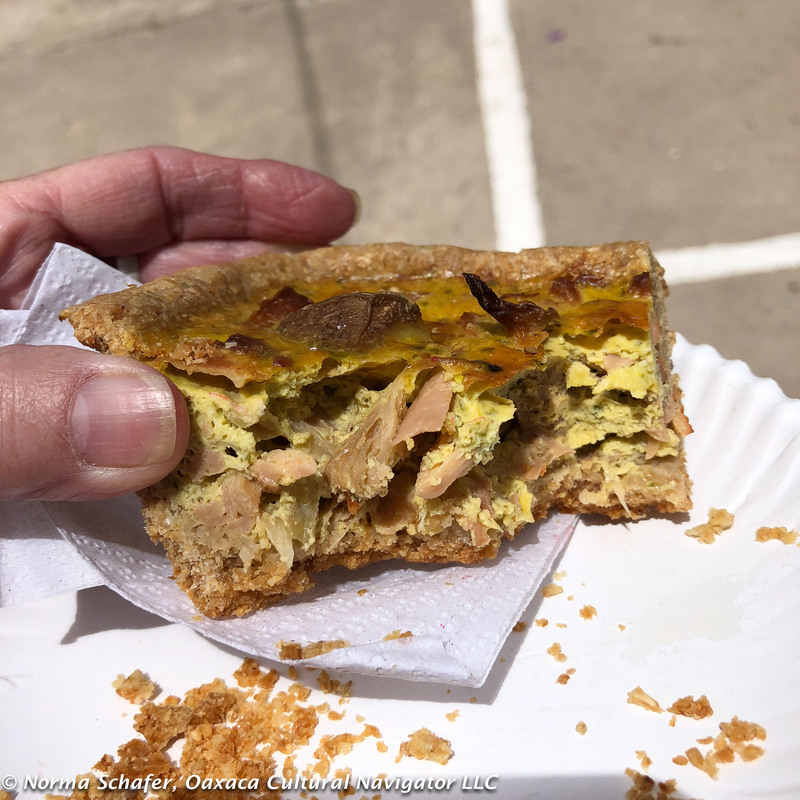 Inside we found eighty-year-old owner Viviana Lucia Martinez Zaragoza, who Chef Susanna Trilling says runs the best kitchen in town. I bought more mushrooms. She invited us back for a trout lunch. 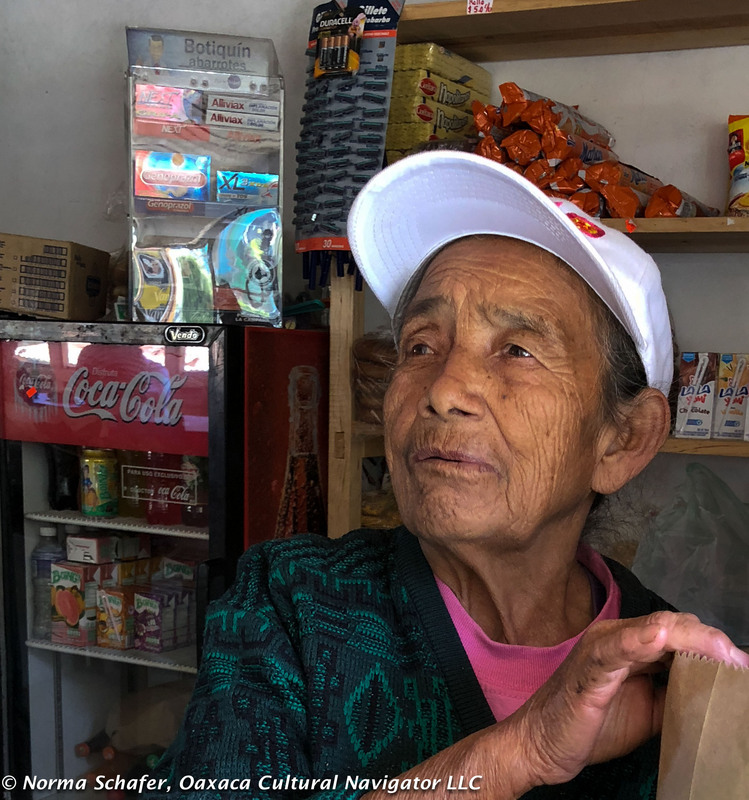 We decided to take the dirt road back from Cuijimoloyas to Teotitlan del Valle that goes through the mountain town of Benito Juarez where there are more cabins and is favorite eco-tourism spot. It was like a ribbon winding through pine stands, sheer cliffs and skirting deep forested valleys. It was not a short-cut, but offered gorgeous views of the Tlacolula Valley. The trip back took about an hour. We knew we were close when we saw the village reservoir in the distance. Then, a familiar car was approaching. 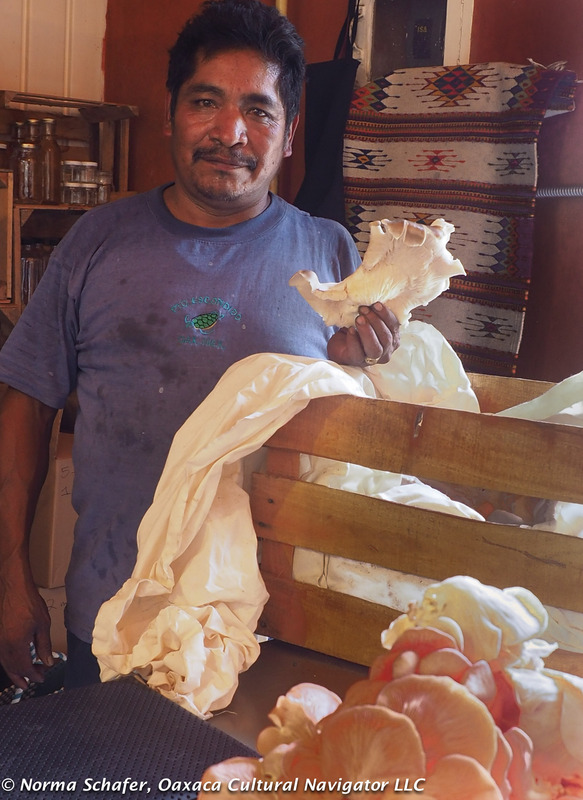 My taxista Abraham Flores was going up the mountain taking a family home from the Tlacolula Market. This is a small world, though vast in what it provides. 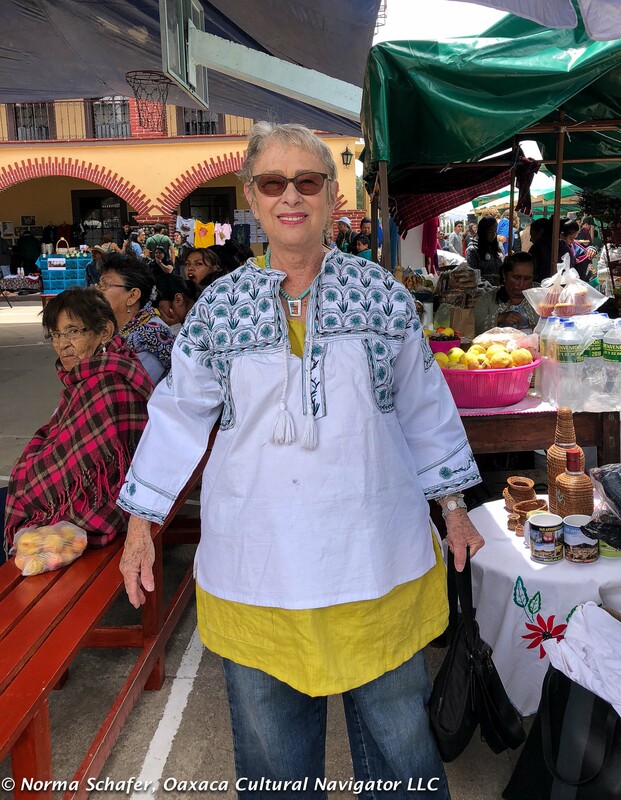 A machine-stitched top from Tlahuitoltepec. Nope. Didn’t buy it. 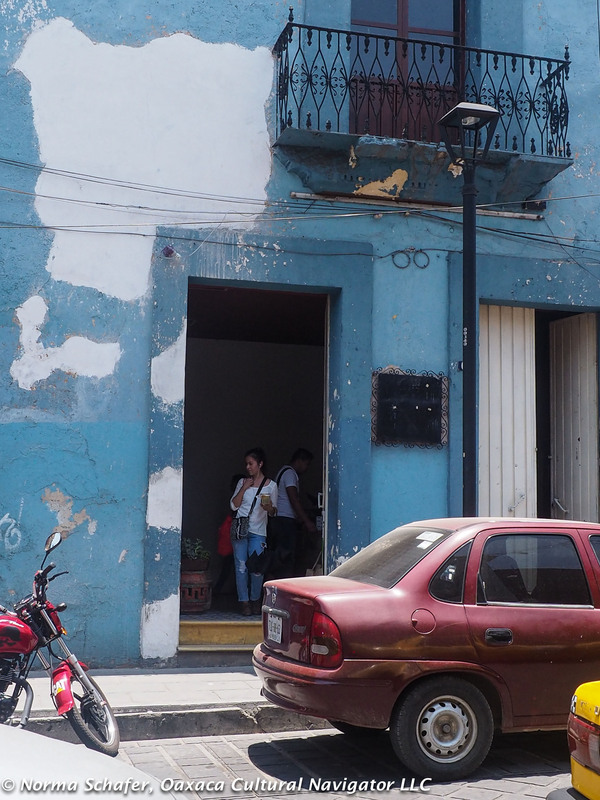 You might walk by the unmarked building painted sky blue and not even notice what’s inside. Down the street from Boulanc bakery on Av. Porfirio Diaz, closer to Morelos than Murguia, is Suculenta. 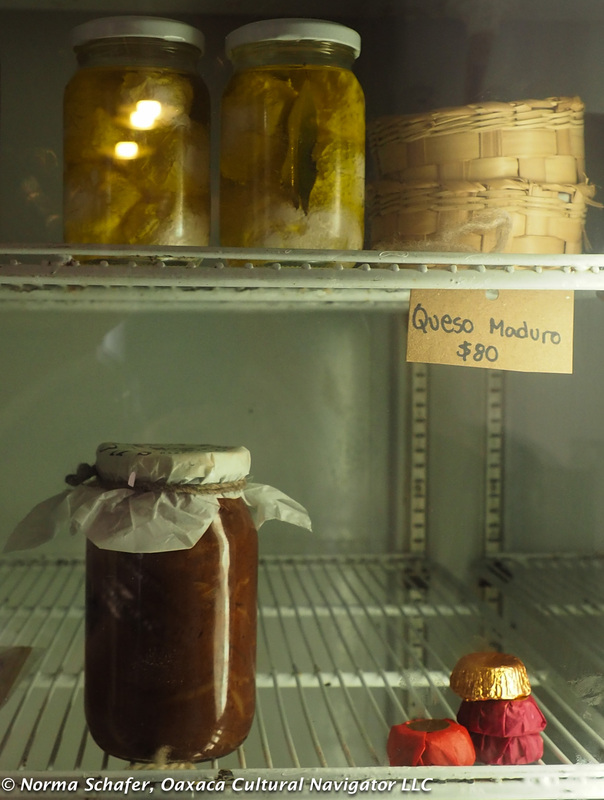 The food gallery is an off-shoot of the bakery where hand-crafted jellies, jams, edible oils, cheeses, herbs and fresh wild mushrooms from the Sierra Norte are featured prominently on custom-built wood shelving and in commercial refrigerator cases. This is where Paulina Garcia Hernandez works her culinary magic in a small space that yields big — and delicious — results. 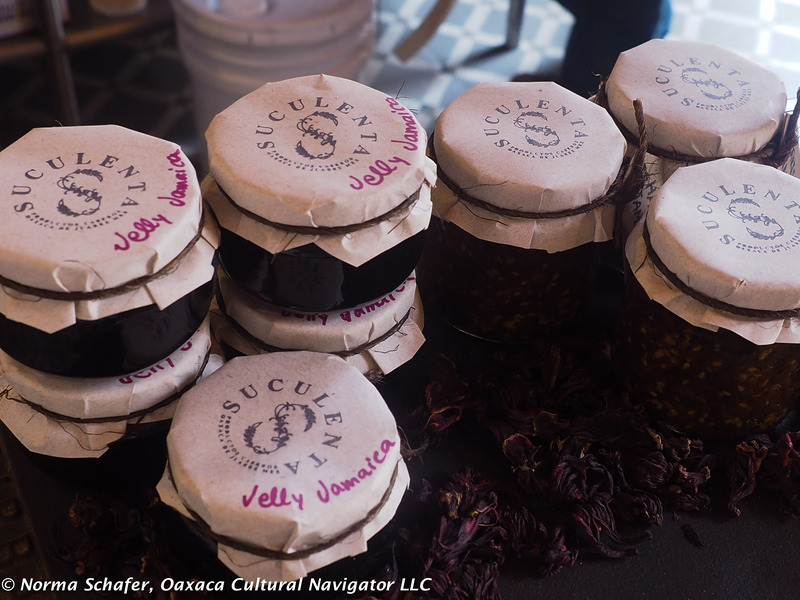 By her side is Daniel Lopez Gonzalez who attends to procuring deliciousness from the best purveyors. 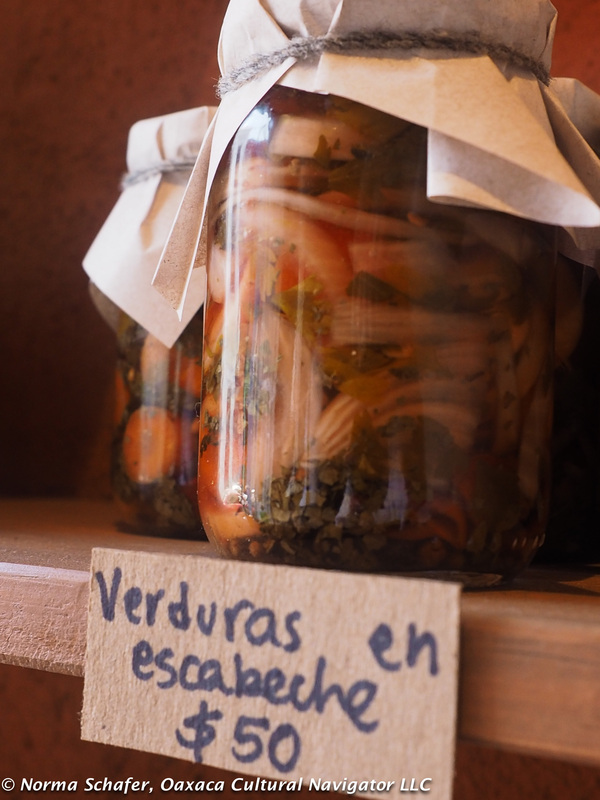 Shelves are stocked with wild mushroom marinated in vinaigrette, pickled carrots, cucumbers, and vegetable mix. 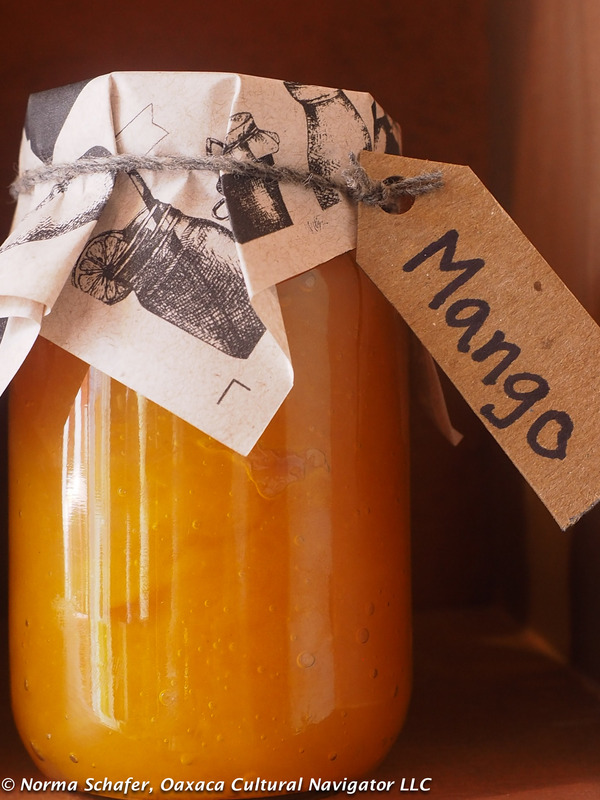 Here you can find organic honey infused with cardamom, too. 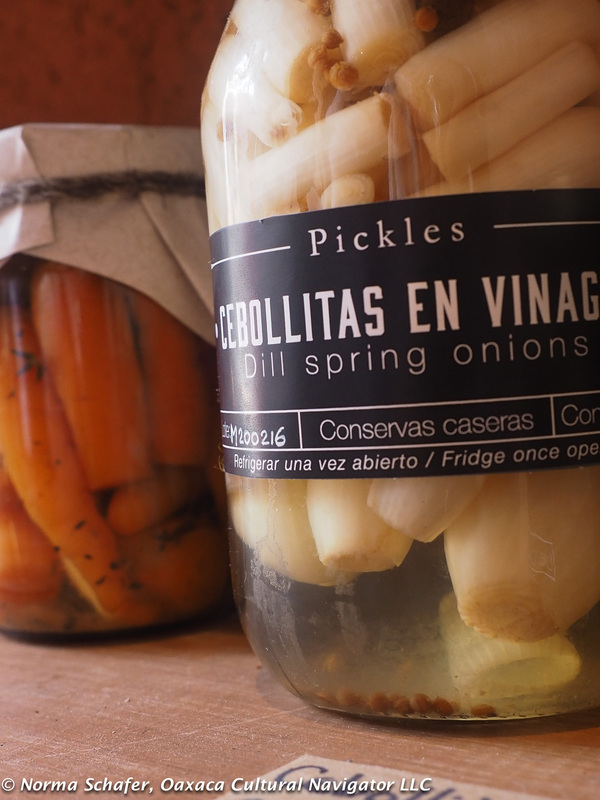 All the cooking and canning is done on the premises using fresh organic fruits and vegetables that are local to Oaxaca. 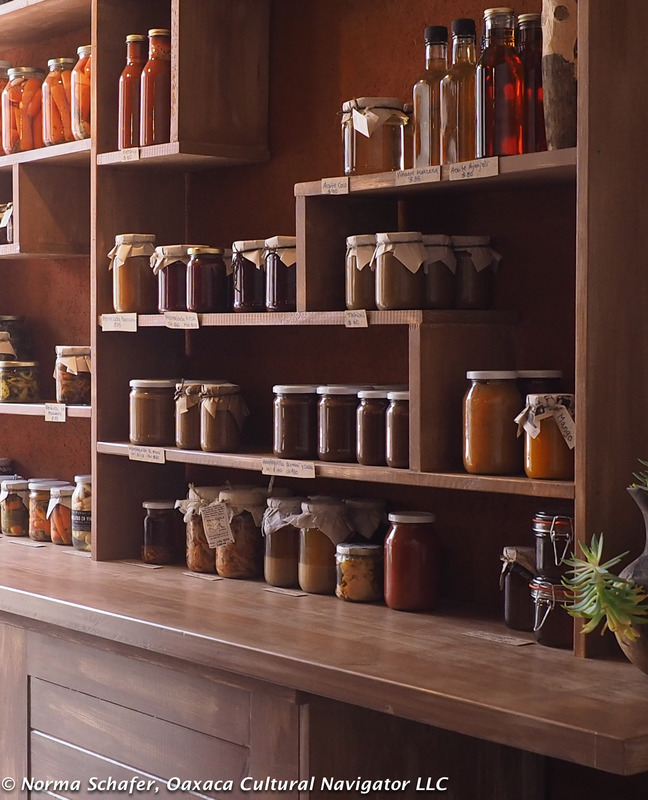 Purveyors are selected for the quality of what they produce. Paulina and Daniel establish personal relationships with each. 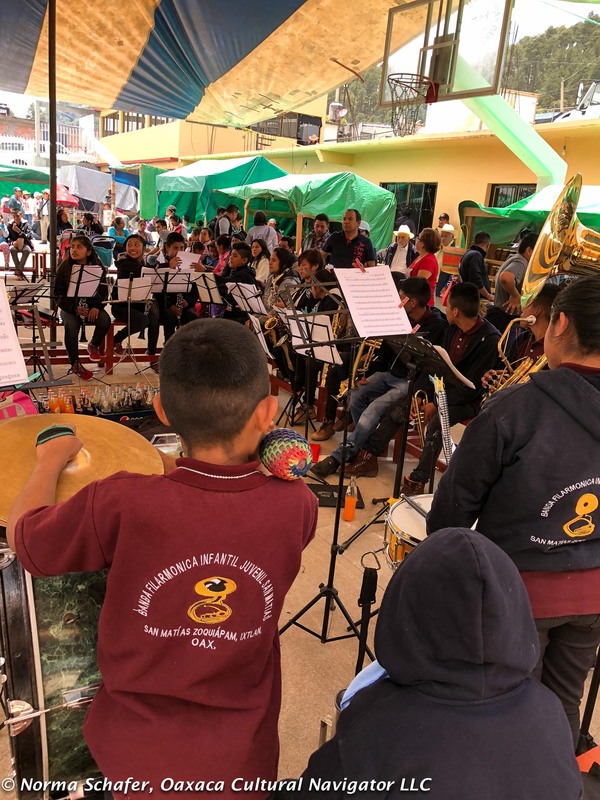 Silbestre Perez Hernandez comes to Oaxaca from Pueblo Manzanito Tepantepec, in the municipality of Santa Maria Peñoles in the Mixteca mountains west of Zimatlan. 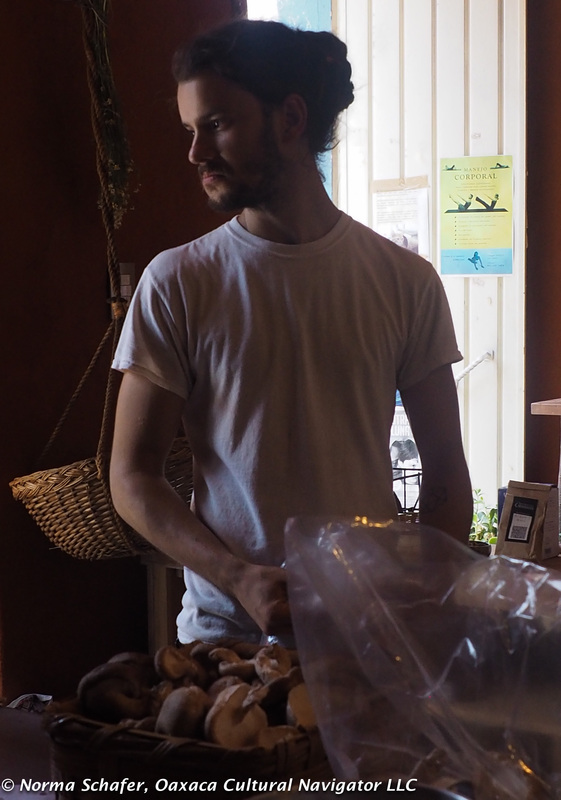 Here he harvests the most gorgeous mushrooms I’ve ever seen. He delivers them to Suculenta weekly. I was there on a Tuesday morning to watch the harvest come in. 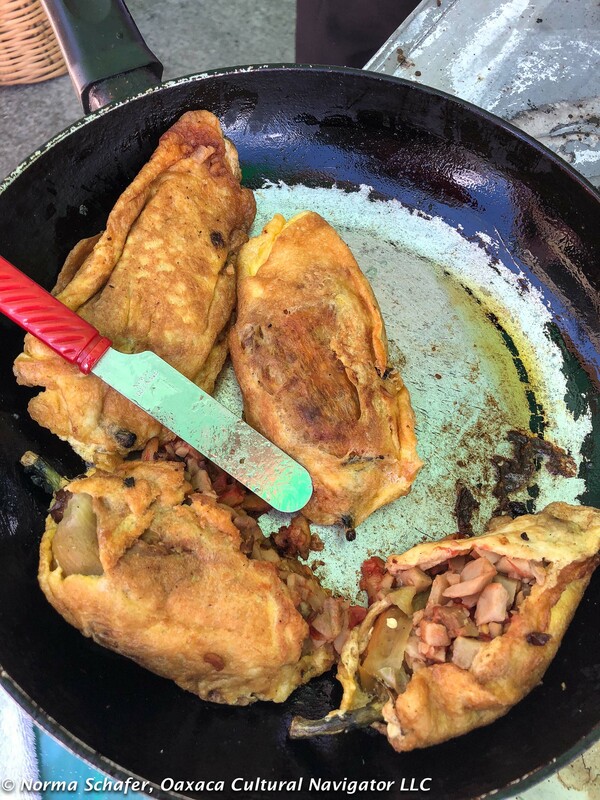 The artisanal cheese is wonderful for omelets, on top of toast or to eat as a post-dinner course with fresh fruit and a glass of mezcal. 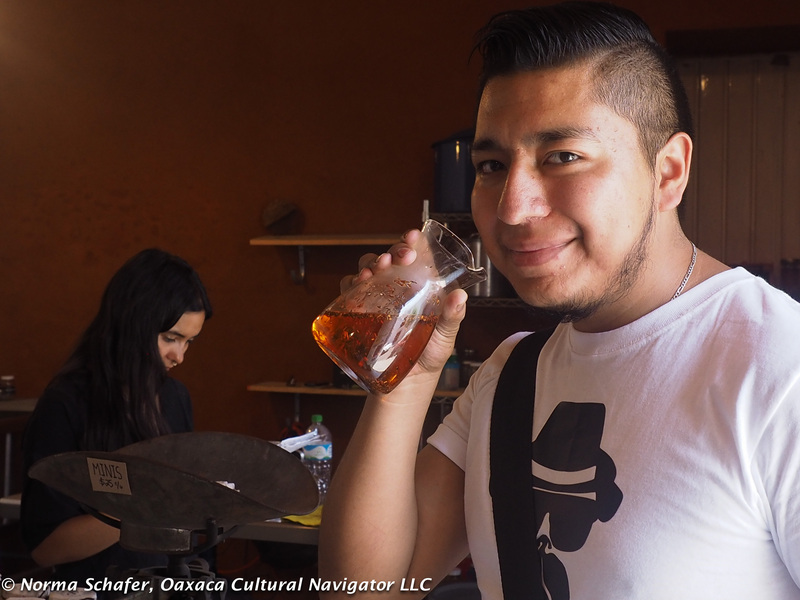 Andres Alquiara developed a recipe for rooibos tea that he brought to Suculenta for sampling. I smelled it. Delicious. Succulent! 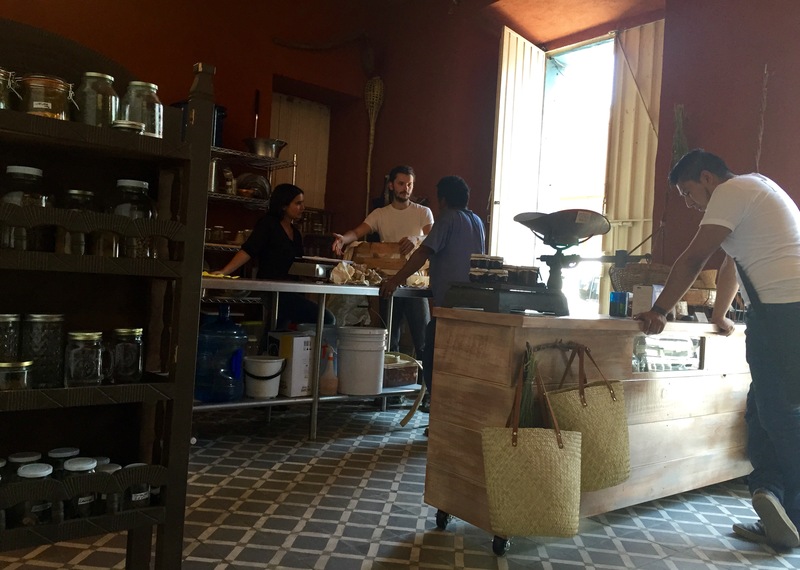 Andres is a barrista and his full-time job is at La Brujula. He has a passion for great food and beverage. This creative food gallery endeavor reminds me of a time past when I owned and operated a gourmet cookware shop and cooking school. I, too, once made and sold jams, jellies, cheesecakes, and catered meals. Now, I prefer to support those who believe that good food is an essential part of living a quality life. 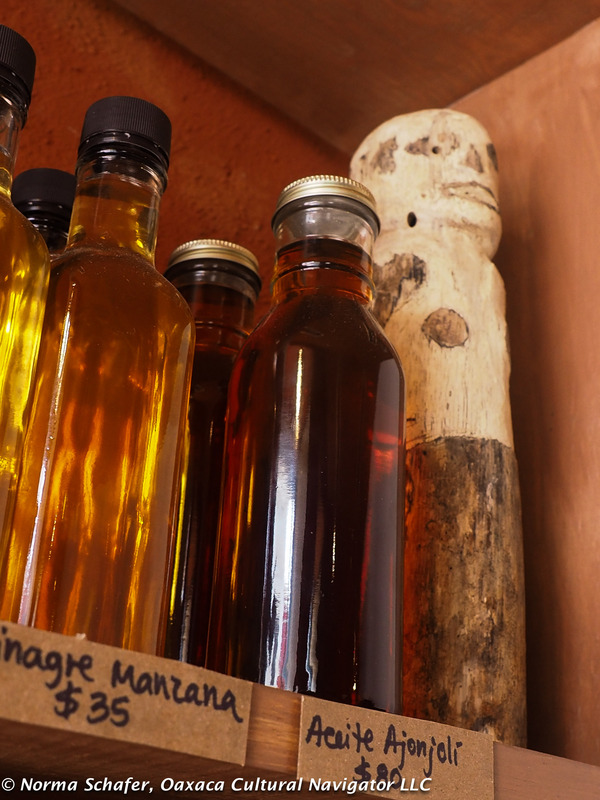 For example, flavored oils (sesame) and vinegars (apple) for eating and cooking!